Garfield comes to life at local golf course! 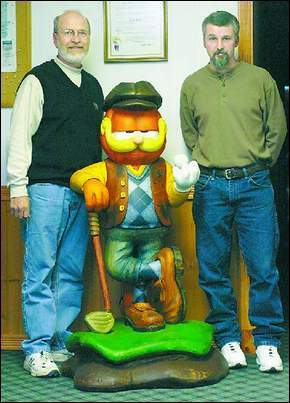 TEE TIME FOR GARFIELD- Arbor Trace Golf Course owner Jack Hart, left, and artist Scott Brown with the wood-carved Garfield created by Brown and designed by Garfield cartoonise and county resident Eric Reaves. December 16th 2006 - This is from an article in the December 15th edition of The Chronicle-Tribune written by MIRANDA MORLEY. When most people have an unsightly tree stump on their property, they call a removal service.But Jack Hart isn't most people. When he had an unsightly tree stump on his golf course, Arbor Trace, he called Scott Brown, a chainsaw artist, to inquire about carving the trunk into a Garfield statue. "We had a tree, and we were thinking about doing something (with the Garfield project) for several years," Hart said. "About that time Pete Beck decided to do the Garfield statues for different communities. We thought we could do something for people traveling through Grant County. "Unfortunately, the tree was not the right type of wood to be used for a statue, but Hart continued Beck's project that he felt was so vital to Grant County, commissioning a new type of wood to be used for the statue. "While traveling around the country, my wife and I realized that other communities were starting to increase tourism with statues," said Beck, explaining how he got the idea for the Garfields. "I'm hearing all kinds of good comments. I've haven't heard anything but positive feedback (for the project). "The Garfield statues were intended to unite the different Grant County communities in history and to commemorate Grant County native and Garfield creator Jim Davis' contribution to the community. Each statue is outfitted to exhibit qualities of its location. Hart's statue carries a golf club. "(The statue) is displayed in the snack area of the clubhouse, in a place where, hopefully, people will come out (to see it) even if they are not golfers," said Hart. "Maybe people will stop by and get his picture. "According to Hart, the statues help Grant County achieve a sense of community and historical value. It was this community appeal that convinced Hart to order the statue. "When people visit different communities, (the statues) will be of some historical value to the community. Being able to represent Grant County, helping to draw people in when they are looking for someplace to go, just being a part of it (is important)," Hart said.The golf course Garfield is the only one in Grant County that is made out of wood, and, like the other statues, it was designed by Garfield cartoonist and county resident Eric Reaves.